Bodysuits (or as Brian calls them "onesies") are super popular right now and though at first I was confused at the point of them, now that I have a few, I am a FAN! The thing that's great about them is that if you want that tucked-in shirt look they make it so easy and your shirt does not ever come un done. The worst thing about them is going to the bathroom -__- There's little snaps in the crotch but I like to tackle it romper style and just pull it down. Seems easier to me then trying to snap shut my own crotch snaps - yikes! Ok that sounds a little more graphic than I intended... moving on! Whenever I wear a tighter/more form fitting top I like to wear bottoms that are a little looser. This corduroy skirt worked out perfectly. It's still form fitting but the thicker fabric and slight flare gives the illusion of a looser fit. Plus the button up front is adorable! 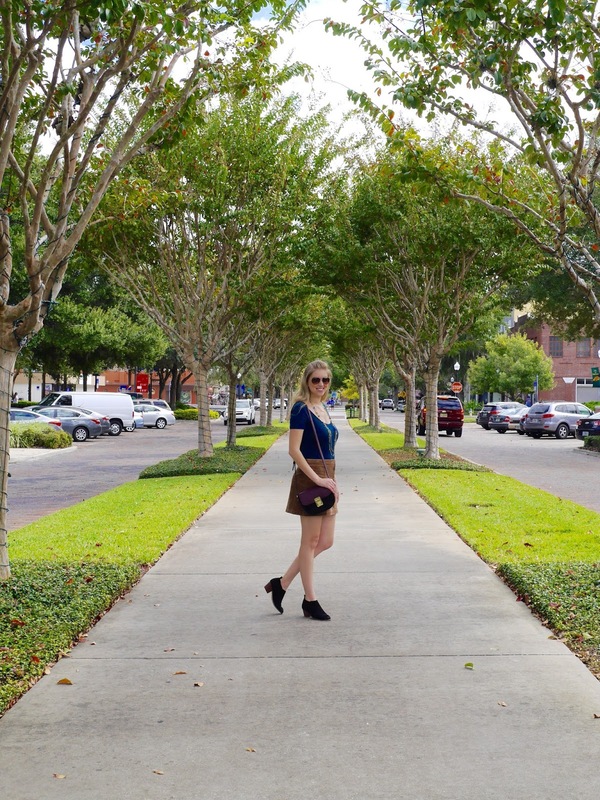 I love how my black booties go perfectly with my favorite plum and black suede purse (that you've seen quite a bit lately!). My necklaces are just some old standbys from my closet - layering necklaces when you're wearing a plain top is never a bad idea! Have you tried out a bodysuit? What are your pro's and con's for it? Comment below, I'd love to hear your thoughts!